What is Christmas all about? Santa Claus? Presents? Family gatherings? The real meaning of Christmas does involve a Gift, the greatest Gift of all - the birth of our Lord Jesus Christ. What better way to be reminded of what God gave to us than with a beautiful olive wood Nativity Set? Displaying your own hand-carved nativity set, crafted from olive wood from the Holy Land, is the perfect way to commemorate the miracle of the Virgin birth and to refocus your attention during the hustle and bustle of the holiday season. With decorating, shopping, writing cards and baking cookies, it's easy to forget the reason why you're doing all of this. That's why an olive wood Nativity display is almost a necessity in anyone's home. After all, none of us wants to forget, for even a moment, what the Nativity is all about. Jewish prophets foretold the birth of a Messiah in Bethlehem who would deliver their people from their oppressors. 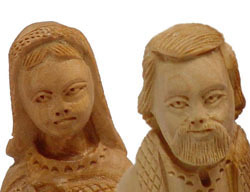 Because of a tax census, a carpenter named Joseph and his wife, Mary, traveled to Bethlehem. Mary, who was a virgin who conceived the Son of God by the Holy Spirit, was "great with child" according to the Gospel of Luke. Since the inns were full of other travelers, Joseph and Mary had no place to lodge, but seeing that she was close to delivering her baby, an innkeeper offered them shelter in an animal stable. Giving birth to Jesus there, she laid Him in a feeding trough. Shepherds in a field were greeted by angels who sent them to the stable to worship the newborn King. In the beginning of the 12th century, St. Francis of Assissi celebrated a Midnight Mass in a stable. The Christmas story was reenacted with men and live animals and the word 'creche' emerged, derived from the German word for crib. Creche, referring to the manger where Jesus was born, was later referred to as the place of the Nativity. The Gospels of Luke and Matthew describe the Nativity story and Luke's version is often read on Christmas Eve as a reminder of the reason we celebrate Christmas. Apart from the reading of the Christmas story, it is important to be reminded daily of it, especially during the busy holidays. That's why many homes include Nativity sets as part of their Christmas décor. 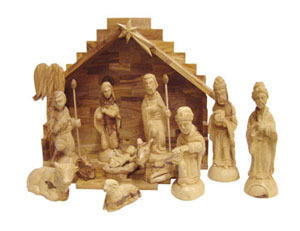 Hand-carved olive wood Nativity sets add the perfect touch to anyone's decorating scheme. Knowing the olive wood comes directly from the Holy Land where Jesus was born and lived makes the Nativity set even more meaningful. Some people choose to display collections of Nativity sets rather than just having one. Of course, including an olive wood Nativity set adds to the authenticity of the display and is a unique addition to your collection. Collecting nativity sets from around the world and from various cultures makes no sense without featuring an authentic olive wood Nativity set. Being reminded of that night when Jesus was born in a lowly stable helps you and your family to focus on the reason Christ came. Celebrate His grace and mercy with an olive wood Nativity set that is sure to become a family heirloom. 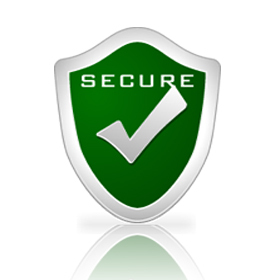 Do you want the perfect gift for the holidays? Something special that can be enjoyed for years to come? An olive wood nativity set, with the Zytoon seal of approval, comes directly from our workshop in Bethlehem, and is the perfect gift for your loved ones. Our affordable olive wood nativities come from our family’s small factory in Bethlehem, and are all hand-carved from the indigenous olive tree into magnificent pieces of art. A nativity set is a perfect gift for all! The nativity set is both a meaningful present and a beautiful scene to share. The olive wood is designed and intricately cut into cherished pieces-a nativity set is a gift someone can treasure for life. Each piece of our olive wood nativity sets is made from premium olive wood, and crafted by the top carvers in Bethlehem. Our affordable prices make our nativity sets the most valuable collectors item. My father personally makes sure that our nativity sets are carved from the finest olive wood, and that each piece in the set is matched to the appropriate grain of olive wood. Each lovely olive wood figurine is made without ever damaging the parent tree-we carve only from the pruned branches. We would like to share our nativity sets with you. The gift of a nativity set, especially one that comes from that same beautiful Bethlehem, where Jesus was born, is an invaluable present. It is made in our small factory just minutes from the Nativity Church, just steps from where Jesus first appeared in our midst. The nativity set evokes a feeling of peace and prosperity for all humankind. The beautiful natural olive wood set, which includes Joseph (with staf), Mary, Baby Jesus (in his manger), The Three Kings bearing gifts, a Shepherd (with staf), a Cow, a Donkey and two Sheep, takes us back two thousand years. It commemorates the time of Jesus’ infancy, and his importance to all Christians.Average height of the figures is about 6.8 inches . 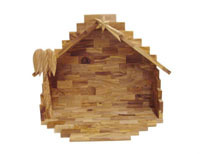 This set includes an Olive Wood Stable (Crèche) that has a collapsible base for easy storage. The base folds back so that a nativity set can fit inside the stable. 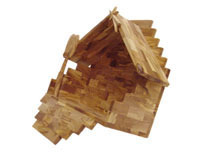 A special highlight of this Stable (Crèche) is the natural bark roof, which gives it a rustic look. A special box to put the complete set is included. It is about 9.6 inches in height, 11 inches in width and 6.6 inches in depth.